Big Buck HD Panorama is the alternate configuration model for Big Buck HD. With a 42" ruggedized enclosed LCD monitor, it offers a larger screen than the 32" model. 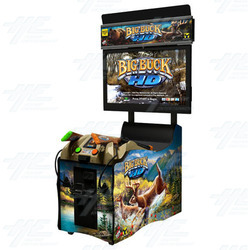 A two player shooting game from Raw Thrills and Play Mechanix, gameplay features high definition hunting in North America and Africa with fresh new gameplay, Trophy Animal Challenges, heaps of online features - including real-time gameplay and tournatments - and in-game promotions. Big Buck HD Panorama will entertain veteran hunters and greenhorns alike. Big Buck HD Panorama will entertain veteran hunters and greenhorns alike. Includes new Dell PC with one year warranty.